Hypocrisy in the White House? Shocker. The threat of nuclear escalation is less likely than you may think. In this tweet, President Trump calls the “Fake News” the enemy of the American people. Ironically, Trump censures credible, trustworthy news sources such as CNN, the New York Times, and the Washington Post. The real concern that Trump does not discuss with the people is genuine fake news stories that have a goal in undermining credibility of the legitimate news outlets’ stories, and spreading propaganda through lies and deceit. Originally, “Fake News” was defined as news that was falsely reported and aimed to spread propaganda through lies. The President’s definition of “Fake News”, however, is seemingly any reports that contradict or denounce his presidency and persona. The President attacks “Fake News” outlets because he disagrees with the reporting that those outlets do. The White House calls the press “the opposition party,” which could be a warning sign for the future of free press. The label of “Fake News” to describe news outlets that the White House disagrees with is an early attempt at systematic censorship of the free press. The message the White House is sending is to not listen to the press groups that the president condemns. 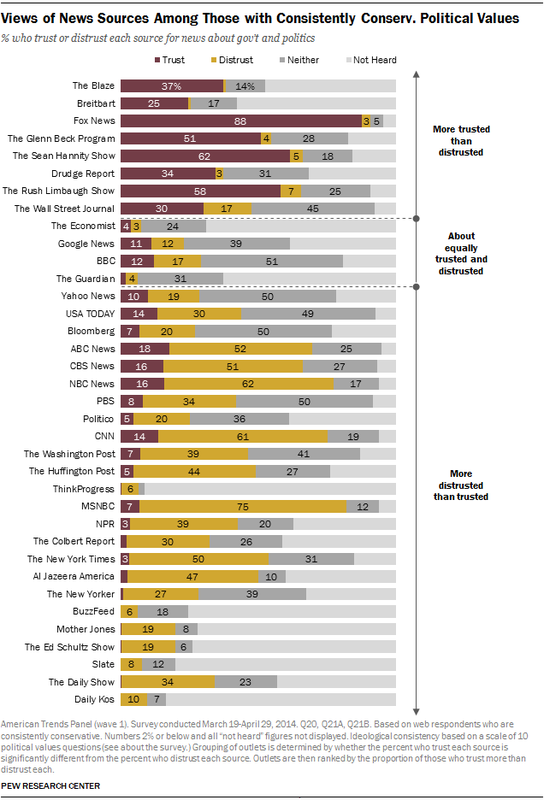 It is no coincidence that Republican President Trump has a negative bias towards more left-leaning media outlets, as all 5 media outlets that he tweeted to be “Fake News” are less trusted by conservatives, according to this Business Insider sourced diagram. However, members of Trump’s own party have voiced their concern over Trump’s attempts to silence the members of the free press that does not agree with him. In an interview with NBC News, Republican Senator John McCain said that “we need to learn the lessons of history,” and that the suppression of free press “[is] how dictators get started.” Senator McCain is referencing Nazi Germany, where Hitler’s regime censored and silenced all forms of expression that contradicted the regime’s ideology. The Nazis took control of the press, and used it as a vehicle to impose propaganda on the citizens of Germany and alienate the truth about what was happening. A minor instance of the press being silenced by the president occurred during a White House press conference. During this press conference, a Jewish reporter asked a question about the upswing of anti-semitism in the US, where he was shortly thereafter called a liar and asked to sit down. Another piece of evidence that shows Trump refuting negative reviews of his presidency is the tweet he sent out about CNN’s negative approval rating polls. This is an overt instance of President Trump trying to mask the disapproval that his presidency has caused within a cluster of American people. Bias is something that comes along with the privilege of free speech that America’s founding fathers gave the people. Not every person will agree with each president’s decisions, due to differing opinions and the diversity that America enjoys. The disagreements between politicians in the American government prevents complacency, which in the case of political power, has the potential to morph a democracy into an authoritarian dictatorship. The absence of disagreement with elected officials would cause the democracy we hold so dearly to become a dictatorship. Legitimate Fake News is something that citizens must work to prevent, but the “Fake News” outlets that the President has called out must be encouraged to keep reporting without intimidation from government officials and keep the public informed of the truth. We the people must never lose sight of the First Amendment no matter what, for the truth is at stake. The repercussions of actions and thought processes of American citizens that are based off of “Alternative Facts” are grim. The First Amendment is what makes the “free world” truly “free”, and limiting expression by certain media outlets could spiral into limiting the expression of certain marginalized ethnic groups, just like what happened in Nazi Germany.